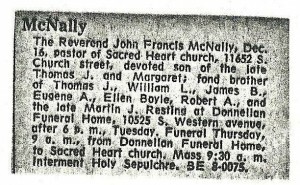 The Reverend John Francis McNally, Dec. 16 (1963), pastor of Sacred Heart Church, 11652 S. Church Street, devoted son of the late Thomas J. and Margaret; fond brother of Thomas J., William L., James B., Eugene A., Ellen Boyle, Reobert A., and the late Martin J. Resting at Donnellan Funeral Home, 10525 S. Western Avenue, after 6 p.m., Tuesday. Funeral Thursday, 9 a. m., from Donnellan Funeral Home, to Sacred Heart Church. Mass 9:30 a. m. Interment Holy Sepulchre. BE8-0075. There two headlines that week on the Southtown front page. One for Fr. 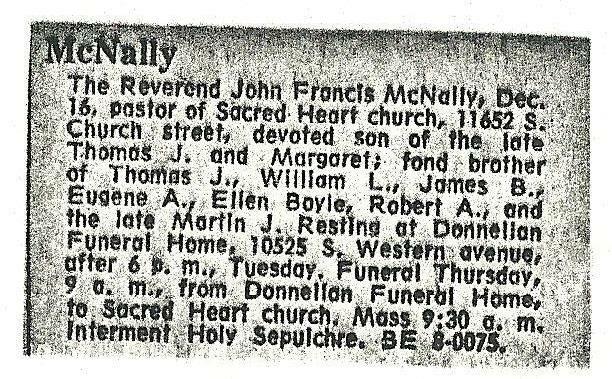 McNally’s death and one for my Mother for saving a family of five neighbors. He baptized me, watched over me, and taught me that religion isn’t some dogma wrapped up in an enigma. Good man. Thanks for sharing! Sacred Heart, its priest and parishioners are truly special.